Mine: Every time I see this I like it more. Major teary movie. 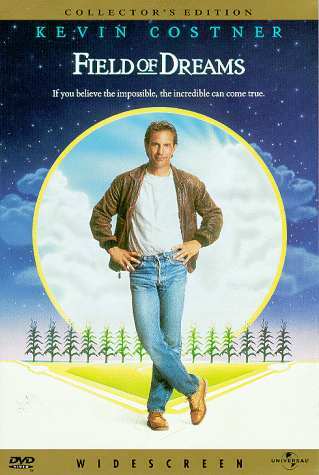 Leonard Maltin/Plot synopsis: Costner plays a novice farmer in Iowa who hears "a voice" that inspires him to build a baseball diamond on his property, in the hope of bringing the legendary baseball star Shoeless Joe Jackson (whose career was cut short by the Black Sox scandal) back to life. A story of redemption and faith, in the tradition of the best Hollywood fantasies, with moments that are pure magic. Kudos to writer-director Robinson, who adapted W. P. Kinsella's book Shoeless Joe, for hitting (and maintaining) just the right note from start to finish. Lovely score by James Horner.